I was recently at Family Reunion, which is a conference for Keller Williams agents and staff to network and LEARN!! This year I was asked to serve on a panel to share some tips and tricks. 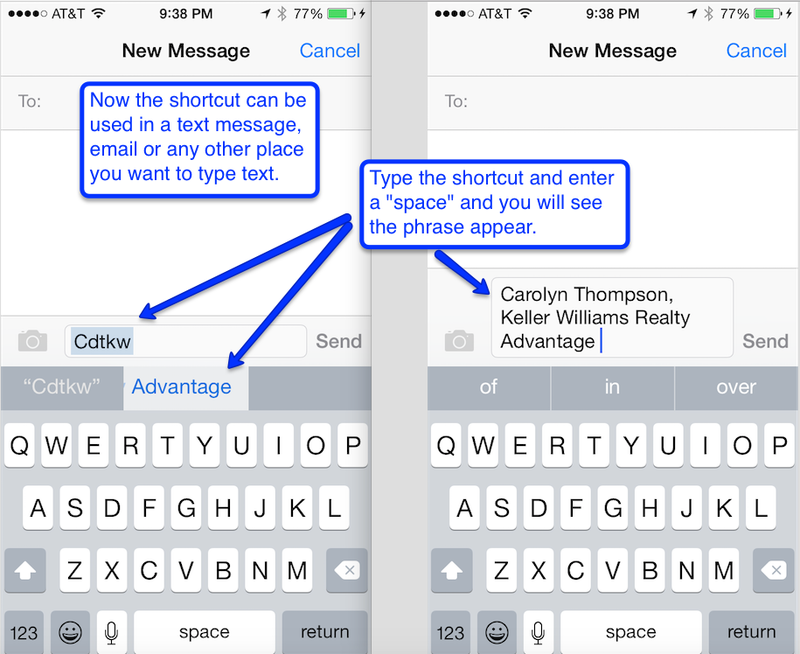 One of the tricks I mentioned was how to create an iOS Keyboard Shortcut. Several have asked for some directions on how to do this, so here we go. Go into your “Settings” and scroll down to “General” then “Keyboard”. Once you are in the “Keyboard” area scroll down to “Shortcuts” and then click on the “+” at the top right. The “phrase” at the top is what you want the keyboard to type for you for example your name and company (Carolyn Thompson, Keller Williams Realty Advantage). The second item says “shortcut” and this is where you put the letters and/or numbers you want to type to make it insert (cdtkw) and don’t forget to click “save” at the top right. The cool part is that when you create the shortcut on your phone it will also translate on your MAC as an example, it added the shortcut above when I typed those letters and I had to “undo”. You can use this for many things. I have the shortcut above and several others. What about a shortcut for requesting a showing or sending a list of lenders, sharing your mobile app or any phrase that you repeat on a regular basis. Don’t make it a single word or you will end up with creating a shortcut that will replace words you are actually trying to type. How many shortcuts and phrases can you create? What are your ideas? 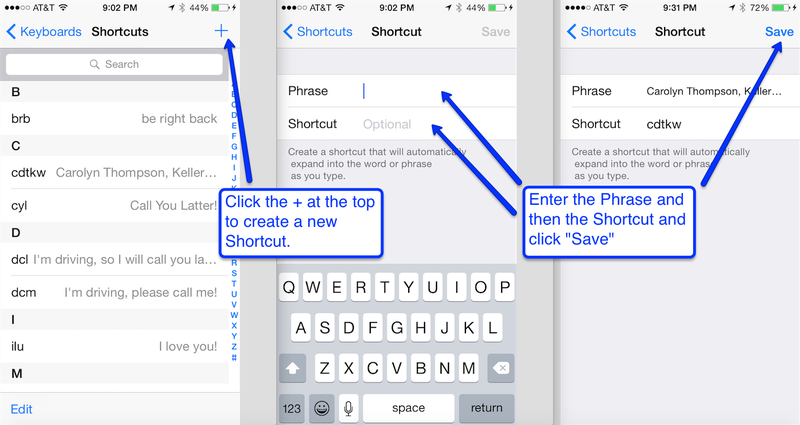 I hope these iOS Keyboard Shortcuts can help you!